Donna E. Shalala became "Professor of Political Science and President of the University of Miami on June 1, 2001. President Shalala has more than 25 years of experience as an accomplished scholar, teacher, and administrator. 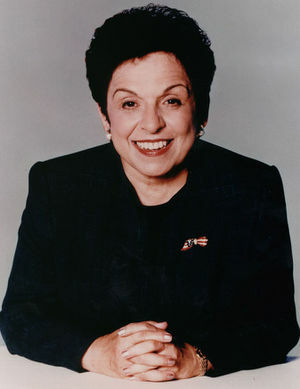 Shalala was Secretary of the U.S. Department of Health and Human Services under President Clinton, and presided over the largest government smoking intervention effort ever undertaken, the American Stop-Smoking Intervention Study, or ASSIST. "Born in Cleveland, Ohio, President Shalala received her A.B. degree in history from Western College for Women and her Ph.D. degree from The Maxwell School of Citizenship and Public Affairs at Syracuse University. A leading scholar on the political economy of state and local governments, she has also held tenured professorships at Columbia University, the City University of New York (CUNY), and the University of Wisconsin - Madison. She served as President of Hunter College of CUNY from 1980 to 1987 and as Chancellor of the University of Wisconsin-Madison from 1987 to 1993. "In 1993 President Clinton appointed her Secretary of Department of Health and Human Services (HHS) where she served for eight years, becoming the longest serving HHS Secretary in U.S. history. At the beginning of her tenure, HHS had a budget of nearly $600 billion, which included a wide variety of programs including Social Security, Medicare, Medicaid, Child Care and Head Start, Welfare, the Public Health Service, the National Institutes of Health (NIH), the Centers for Disease Control and Prevention (CDC), and the Food and Drug Administration (FDA). One of the country’s first Peace Corp volunteers, she served in Iran from 1962 to 1964. "As Chancellor of the University of Wisconsin-Madison, she led what was then the nation’s largest public research university. She successfully strengthened undergraduate education, the university’s research facilities, and spearheaded the largest fundraising drive in Wisconsin’s history. In 1992, Business Week named her one of the top five managers in higher education. "She served in the Carter administration as Assistant Secretary for Policy Development and Research at the U.S. Department of Housing and Urban Development. In 1980, she assumed the presidency of Hunter College of the City University of New York. "She is a Director of Gannett Company, Inc., UnitedHealth Group, Inc., and the Lennar Corporation. She also serves as a Trustee of the Henry J. Kaiser Family Foundation. Chair, Children's Defense Fund, 1992-1993. Director, Council on Foreign Relations, 1992. Director, American Ditchley Foundation, 1982-1992. Trustee, Committee for Economic Development, 1982-1992. Director, Institute for International Economics, 1981-1992. Director, Children's Defense Fund, 1980-1993. Director, National Women’s Law Center, 1980-1992. Director, Franklin and Eleanor Roosevelt Institute, 1988-1992. Director, International Women's Health Coalition, 1984-1990. Director, Wonder Woman Foundation, 1981-1986. Director, Social Science Research Council, 1981-1984. Director, Welfare Research, Inc., 1976-1977. Trustee, The John F. Kennedy Center for the Performing Arts, 1993-2001. Trustee, World Education, Inc., 1975-1977. Member, Human Rights Watch, 1986-1992. Donna Shalala was among the prominent politicians who may have received favorable mortgage deals from Countrywide, a mortgage lender at the heart of the current mortgage crises. According to an investigation conducted by Conde Nast's Portfolio, Countrywide's V.I.P program may have bent rules to offer Shalala a better deal on a mortgage for a timeshare she was interested in buying into. Shalala was Secretary of DHHS at the time the American Stop-Smoking Intervention Study (ASSIST Project) was started. ASSIST was the largest federally-funded project ever to help states develop effective strategies to reduce smoking. In 1991, the National Cancer Institute (NCI), in partnership with the American Cancer Society, provided funds to 17 state health departments the study. ASSIST's goal was to alter the social, cultural, economic and environmental factors that promote smoking by utilizing four policy strategies: promoting smoke-free environments; countering tobacco advertising and promotion; limiting youths' access to tobacco products; and raising excise taxes to increase the price of tobacco products. These interventions were developed and implemented by networks of state and local tobacco control coalitions. The project consisted of two phases: first a two-year planning phase from 1991 to 1993, and then a six-year implementation phase from 1993 to 1999. NCI provided an average of $1.14 million per state per year during the intervention years, for a total of $128 million over the eight years of the program. Other additional funding and support were available to the states through voluntary organizations and other non-federal sources. The tobacco industry reacted strongly to ASSIST, putting together a well-coordinated attack to try and thwart it. "Long Term Goals • Counter ASSIST Program in 17 states: - Work with grass roots organizations to divert state health department funds, equivalent to the amount of ASSIST funding, to support other health programs (pre-natal care, half-way houses, etc.)." The American Journal of Public Health in 2004 published an analysis of tobacco industry opposition to ASSIST. Shalala worked to defend and support the ASSIST program and assure its completion through years of highly strategized and well-organized attacks against the program by the tobaco industry. Among the American Jewish Committee's vast operations there is one called Project Interchange. It arranges junkets for ‘opinion makers’ so that they are presented with the Israeli position and turned into sympathetic allies in the countries of their origin. While in Israel the PI-attendees meet with government officials, academics, journalists, etc., and of course, there is the mandatory visit to the Yad Vashem memorial. One recent beneficiary of the AJC’s generosity was Clinton apparatchick Donna Shalala who was visiting as part of a group of American university president’s fighting the ongoing campaign for the academic boycott of Israel. Shalala, who is incidentally an American of Arab origin, sang for her shekels. She denounced the boycott campaign and even discussed cooperation with the controversial Bar Ilan University which established the Ariel University Center of Samaria illegally in the occupied Palestinian territories as a regional branch. Despite her overt and enthusiastic support for Israel, she was singled out at Ben Gurion airport and roughly interviewed. ↑ M. Idrees Ahmad, Shalala’s disgrace, Pulse Media, 6 August 2010. ↑ Itamar Eichner , American VIP humiliated at airport, YNet, 8 August 2010. This page was last edited on 8 August 2010, at 13:58.